o Electronic Brake System (EBS) with the new Brake Assistant System (BAS). 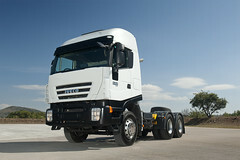 o ESP (available on the full range of 4x2 tractors). o Hill Holder for facilitating hill starts. o Lane Departure Warning System. o Daytime Running Lights (DRL).